This was such an easy choice this week. As soon as I finished The Skylark’s War, after I’d blown my nose and got rid of the tissues, I turned around and went back and read the last 20 pages all over again. Then I messaged my sister and my mother to tell them that they had to read it with a big happy (and soppy) smile all over my face. The Skylark’s War tells the story of Clarry, her brother Peter and her cousin Rupert, through their childhood, the Great War and beyond. Clarry’s and Peter’s mother died soon after Clarry’s birth, their father isn’t interested in them and at first at least, Peter blames the new baby for the loss of his mother. The two children are brought up by a succession of housekeepers, with the interference of the do-gooding spinster across the road. The high point of their lives is their annual visit to Cornwall every summer holiday. Their cousin Rupert spends his holidays there – his parents are in India and have basically forgotten about him and he was sent to boarding school at a young age so Peter and Clarry’s dad couldn’t send them to live with their grandparents. During the summers, all the best things in their lives happen and they grow and mature and become a tight gang. Then Peter is sent away to school, Clarry is left alone with her father. And then there is the War and Rupert joins the army. Can their bond survive? Can they all survive? This is a middle-grade book, and although that synopsis may sound miserable, it is anything but. I mean I did cry my way through a whole pocket pack of tissues, but some of them were happy tears and I just couldn’t put the book down. I had to know what happened. At one point I was sitting sniffling and making a scene of myself in the lounge at a youth hostel, but I was so engrossed in the book that I wasn’t prepared to stop reading for long enough to climb the three flights of stairs to get to my room. The closest I can get to a comparison for this, is if Noel Streatfeild, Nina Bawden and Elizabeth Jane Howard had a book baby. And if that isn’t enough to make you go and read it, then I’m sorry you may be in the wrong place and I’m not sure that we can be friends. My friends are you looking for a comfort read? Because The Skylarks' War is a comfort read right there even though one line made me cry on the tube this morning. It is wonderful. I know I keep banging on about it but I'm going to finish it and I don't want to. I’ve had this on the NetGalley list since the autumn but I had forgotten about it until I saw this tweet from Harriet Evans (remember her? I had some ravings/gushing about one of her books here, here and here. And that might also scratch your Elizabeth Jane Howard itch, except that it’s a contemporary story about a house not a 1930s one.) So off I went to look at the blurb, thought it sounded familiar, looked at my NetGalley, tweeted her back and then the die was cast, my fate was sealed etc. Move it up V. I really think it's your sort of thing. And now I’m telling you that you need to read it. Maybe as a double bill with The Five Children on the Western Front if you can stand all that Great War and foreboding at once. But if you can, read The Skylark’s War second. Trust me on that. I see from the Goodreads write-ups that there’s a connection to one of Hilary McKay’s other novels, so I’m off to find that and then to buy copies of The Skylark’s War to give to people. As I mentioned my copy came from NetGalley, but you should be able to get hold of a copy really easily: it was Waterstones‘ Children’s Book of the Month in January and it won the Costa Children’s Book Award, so I’m expecting it to be everywhere. And yes, I know, this all means I’m late to the party again. But better late than never. Here are some more links to enable your book-buying habit: Kindle, Kobo, Amazon paperback, Book Depository and Big Green Bookshop. Yes, it’s taken a bit longer than planned, but the Noirville winners have finally been announced. In case you missed my original post, I was super excited to be part of the competition amongst an illustrious group of judges. You can read the winner’s list here – and I’m thrilled that pretty much all my favourites made the cut. The standard was incredibly high though and it was really, really hard to separate the stories. All the judging was done blind, so I was really excited to see who was behind the stories that I’d enjoyed reading so much. So today I’ve got a whole load of new people to add to my twitter watch list so that I can see what they’re going to write next. It was such a great experience to have the chance to be a judge on this. It was also absolutely terrifying – definitely out of my comfort zone! The actual published book will be out in a couple of months and I can’t wait to see the finished book, and obviously hear what everyone else thinks about the collection. Congratulations to all the winners – and commiserations to the people who missed out. Here’s to the first Noirville Short Story collection – may it be the first of many! I am not a reader of Award-Winning Books. See my posts here and here for proof of this — and I don’t think the situation has improved much in the last two years. But some times you hear so much buzz and chatter about a book that you have to check it out. Particularly when you luck into a copy of said book. 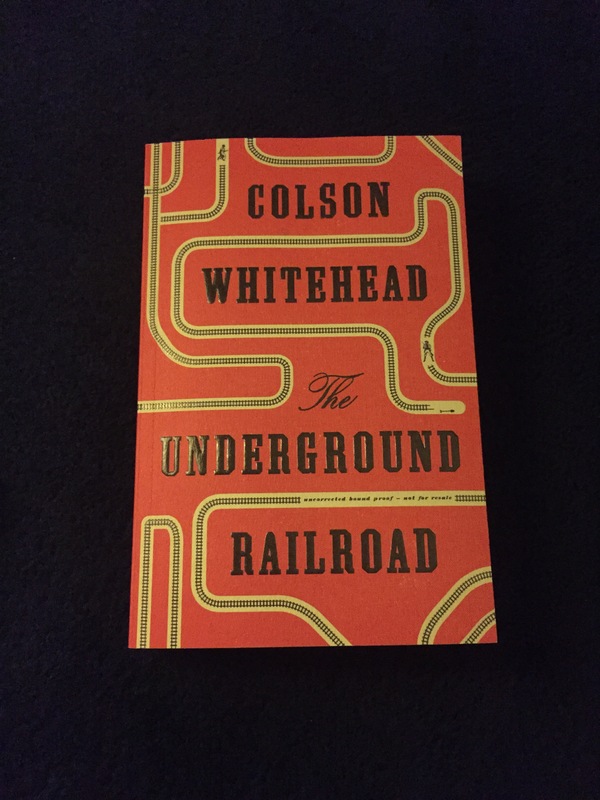 And Colson Whitehead’s the Underground Railroad was one of those books. I’d heard everybody on the Bookriot podcasts that I listen to talking about how excited they were for something new from Whitehead – and then about how brilliant it was. It kept popping up in lists of hotly anticipated books. It was an Oprah Bookclub pick. It was on President Obama’s summer reading list. I apologise for my lousy photography, but I really like the cover – with the train tracks snaking around. The Underground Railroad tells the story of Cora, a slave on a brutal cotton plantation in Georgia. Life is more terrible than you can imagine, especially for Cora who is an outcast among her fellow Africans. When Caesar, a recent arrival at the plantation suggests that they escape together, they take a terrifying risk to try and get to the Underground Railroad. But it doesn’t go according to plan, and Cora’s journey is fraught with dangers as there are hunters after them, dogging their every move. In Whitehead’s world the railroad is real – actual trains in tunnels under the southern states with a network of drivers and conductors ferrying runaways to safety. This is such a powerful book. It’s beautifully written, but oh so difficult to read – I’ve had to take it in bite-sized chunks so that I can digest it properly – but it’s worth it. It makes you confront harsh and terrible truths about what people have done to each other and are capable of doing to each other. But it’s also compelling and personal and page turning and clever. Whatever I say here, I won’t be able to do it justice. I still haven’t finished digesting it and I’m going to be thinking about it for some time to come. It’s going to win all the awards – and it deserves to. It’s already won the National Book Award in the US and is Amazon.com editor’s Number 1 Book of the Year. In years to come it’s going to be on English Literature syllabuses. Well, well, well worth your time. I would expect this to be somewhere prominent on a table or on a front facing shelf in bookshops. It’s in hardback at the moment – and you can get it from Amazon (out of stock at time of writing, which says a lot), Waterstones and Foyles and on Kindle and Kobo. It might make it into the supermarkets, but I’d be surprised. The paperback is out in June. I’m off to read some more of Whitehead’s work. Three months ago, I set myself a challenge to increase the number of award-winning and award-nominated authors that I’d read. An examination of a list of Booker nominees and winners embarrassed me – although I did have a lot of books by authors on the list waiting to be read. So I said I’d try and do better. The proof of the pudding is in the eating – how am I getting on? And the week of the announcement of this year’s winner (Richard Flanagan’s The Narrow Road to the Deep North) seemed like a good time to check in. Well it’s like a litany of failure on this blog. I’m not bringing the to-read pile down, I’m not managing to curb my buying habits as much as I hoped and my literary fiction reading over the last quarter has been a bit patchy. Back in July, the total was seven books that were nominated – of which two had won. Here we are in October, and we’re up to… eight with two winners. Drat. So the new book on the list is NoViolet Bulawayo’s We Need New Names – one of last year’s nominees. And to be honest, it didn’t do much to dispel my preconceptions about award nominated books being hard going. And not hard going because of the subject matter (although that was fairly tough in places) but just hard to read. But it deals with a very important topic and an area of life that I know I don’t know much about and really ought to. So I’m glad I read it, even if it wasn’t the best book I’ve read this year. It’s not all doom and gloom though (I’m frantically searching for bright sides). I started Sarah Waters’ The Night Watch on holiday – although The Boy borrowed it off me when he ran out of reading material and I haven’t finished it yet. And this year’s shortlist included Karen Joy Fowler – and whilst I haven’t read We Are All Completely Beside Ourselves (yet), I have read an earlier novel of hers – The Jane Austen Book Club. So that’s another author who’s been nominated for stuff that I’ve read. 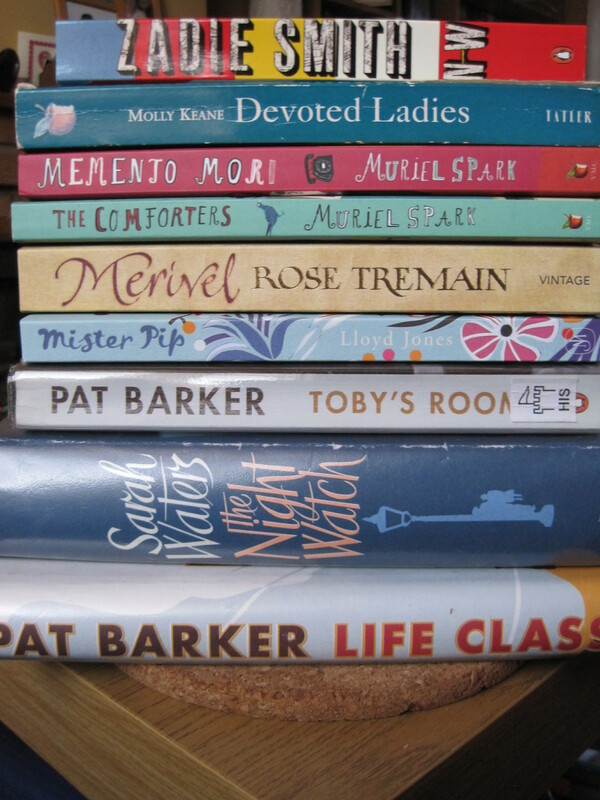 And I’ve read another Muriel Spark, so whilst she was already on the list of author’s I’d read, I have at least reduced the award-nominee backlog on the to-read pile slightly. I read a lot of books. I have read a lot of books. I like to think I read widely and across a lot of genres. But I have not read a lot of award-winning books. Why is this – and what am I going to do about it? In researching this article, I printed myself out a list of the winners and nominees of the Booker and the Orange/Bailey’s prize and the winners of the Costa awards. I settled down with a pink highlighter to mark up what I have read. There is not a lot of pink on the lists. But there are a lot of books that I think I should have read – and others that I would like to read, but have never got around to. What do I mean by not a lot? Well, I’ve read seven books from the list of Booker winners and nominees – yes, just seven. Of that seven, two are winners (Ghost Road and Wolf Hall), one I studied at A-Level (The Handmaid’s Tale), two have been read in the last month (Mrs Palrey at the Claremont and Loitering with Intent) entirely coincidentally and the remaining two have been read in the last year as well (Good Behaviour and Restoration). You may have noticed from that little list that I have only read two books from the last 20 years of Booker nominees. Now considering that I think of myself as a book person, I’m a bit ashamed of myself. There are some authors on the list where I have read some of their other works – just not the prize-winning ones, people like Muriel Spark, Nina Bawden, Penelope Lively, Jill Paton Walsh and David Lodge. But there are some authors where, despite their reputations and in some cases multiple entries on the list, I haven’t read any of their books – let alone the prize-winning ones. People like Salman Rushdie (although I listened to some of Midnight’s Children when Radio 4 serialised it when I was about 14), Iris Murdoch, Doris Lessing, Beryl Bainbridge and Ian McEwan to name a few. There are some who I have books by on the Kindle waiting to be read – two of this year’s list including the winner – that I haven’t got around to because there’s always something “better” there as well. Well, I think it’s partly in my head – I think they’re going to be boring and hard-going. My mum used to read the Booker winner every year – a habit she gave up when she got stuck while reading Ben Okri’s Famished Road. I can remember her saying that there was no point in reading something you didn’t enjoy, that she hadn’t enjoyed the last few winners and she wasn’t going to force herself to read them just because they were winners anymore. I think this has stuck with me – I avoid them because they’re award winners or nominees, even if the blurb on the back makes them look interesting – I think it’s a trick. 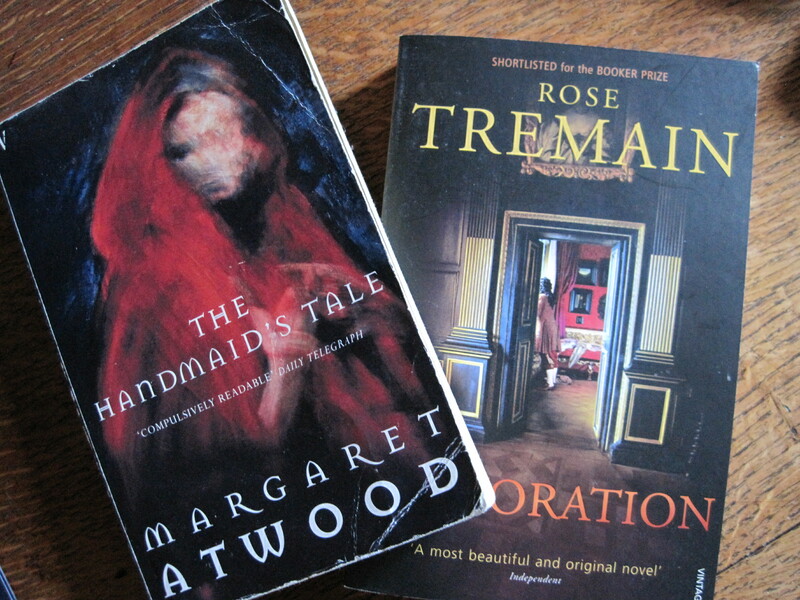 Now I am starting to get over this – the two nominated books I’ve read in the last month, I’ve enjoyed – and I didn’t know they were nominees when I picked them out and read them. In fact I was surprised when I found out – because they were interesting and funny. I’d also like to thank Virago for their role in this – they keep turning out attractive looking reissues of intelligent (and often funny) women’s fiction. 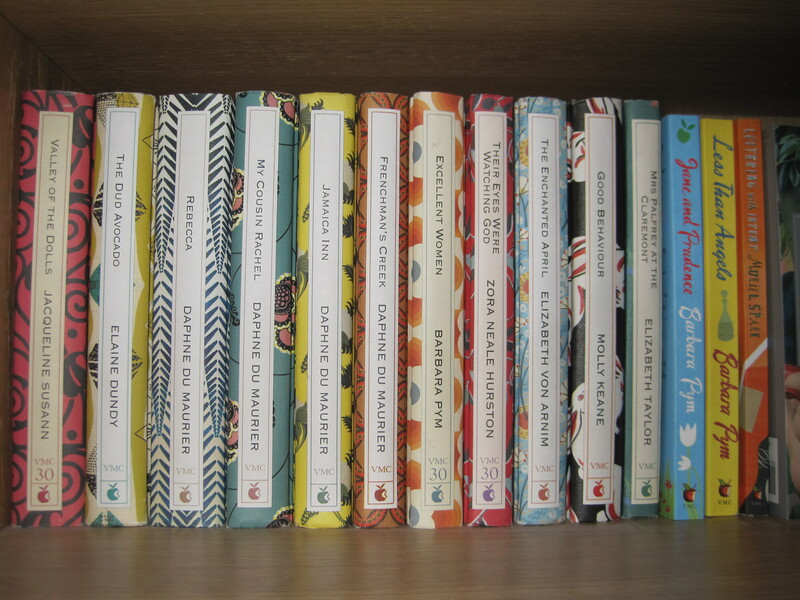 I have half a shelf of their Designer hardbacks – many of which I’ll admit I first picked up because they looked beautiful – and I have a lot of their paperback Modern Classics too. They are widening my horizons. The other issue – that I can think of anyway – is the size of the to-read pile and the Goodreads challenge, both of which mean I often go for books I know I can read quickly so I can get them off the pile. I leave long books and “difficult” books on the shelf – favouring short ones and “light” fiction. Writing this has made me feel a bit embarrassed – and very ill-read. So. I’m going to try harder. I’m going to try to do better. I’m going to try to improve my hit rate with prize winners and prize-winning authors. I’ll start by working my way through the books on the to-read pile that are award nominated or written by prize winners. And to make sure that I do do better and read these books that I say I will – I’ll keep you posted too. Help me on my way by recommending me your favourite prize-winning or award nominated books in the comments below.